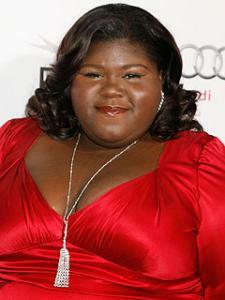 In the wake of actress Gabourey Sidibe’s Academy Award nomination for her incredible performance in “Precious,” many are saying she’ll never get another part in a Hollywood movie because she’s too fat. But they’re wrong: even if the talented actress lost weight, she’d still be too black for Hollywood. Sidibe doesn’t conform to Hollywood’s narrow beauty requirements for romantic leads and stars: actresses should be white women, preferably blonde. Until Hollywood’s executives start looking more like Sidibe and less like Harvey Weinstein, the fat, white guy who founded Miramax, Sidibe’s going to have trouble getting roles. Because Hollywood is run by white men, their counterparts will star in films regardless of their weight (see Jack Black or any Judd Apatow movie) or age (Daniel Day Lewis, Harrison Ford, Mel Gibson, Richard Gere, Denzel washington, Pierce Brosnan, the list goes on and on) or acting ability (Keanu Reeves, Tom Cruise). In producing films, white men get to play God just like they do on the ceiling of the Sistine Chapel, creating their fantasies and selling them to the public. There’s nothing wrong with putting your imaginative stories out into the world, but there needs to be some diversity in the power structure so that other people get opportunities to make their dreams come true too. There is some evidence Hollywood is slowly changing. The reason “Precious” got made at all is because African Americans busted through the racial/ class barrier. Oprah Winfrey and Tyler Perry got successful and got rich, so they were able to make and promote a movie. Successful black women in Hollywood include Queen Latifah, Jada Pinkett Smith, Cicely Tyson, Traji Henson, Viola Davis, and Zoe Saldana. Here are the Hollywood stats from Martha M. Lauzen’s annual study “The Celluloid Ceiling.” I don’t know what the breakdown is on race.